Now White can kill Black's group in the top left corner. The game fight then shifts to the bottom. White 1 kills the top left corner group. 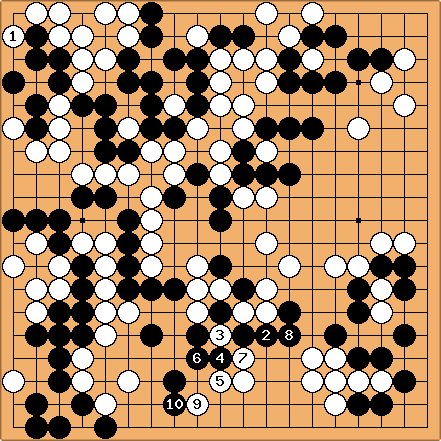 This move is worth 11 points miai counting, not as large as White would like. Black 2 starts the attack at the bottom white group, cutting it from the main forces. White 3 takes one stone. This move will help stones at the bottom to survive. White 5 increases the space and at the same time threatens to start a fight. Black 6 connects solidly. In the fight for life it is important not to give the opponent a forcing move. But could Black connect at 7? White 7 cuts and now White threatens to capture two black stones and connect to the main forces. Black 8 defends the stones solidly. White 9 expands the living space and threatens to connect to another group. Black 10 prevents the connection.